A well-recorded document of a very good 1986 Martyn show comprises the bulk of this CD, yet the three earlier-recorded tracks are the highlights. They're also a weakness of the CD in a way, as the song flow and performance style is disrupted by their placement alongside the very different 1986 show. It's a weakness that's easily forgiven, though, because these early songs are performed so well. Leading off with a 1971 track, "Head and Heart," that's heartfelt and assured, the CD segues well into a 1977 performance of the traditional "Spencer the Rover," the video footage of which was included on the BBC in Vision videotape. From the same performance is the closing track, a long version of his signature concert piece "Outside In," drenched in glorious waves of echoplexed guitar. 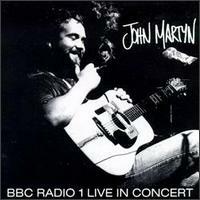 All in all, as far as live Martyn albums go, this one has some of his finest playing. An excellent release from the BBC archives (on the Windsong Label) featuring 9 tracks recorded at Glastonbury in 1986. John turns in a great performance full of passion and power. John's guitar playing is a feature of the album and Alan Thompson's bass rhythms are superb.